The Communications Committee, like all our Board committees, is reviewing its role and the appropriate Policy and Procedure sections of the BCRTA Handbook. This is an opportunity to review and remind ourselves of the work we do as volunteers for the BCRTA, and update sections of the Handbook as the organization continues to grow. As a member-led organization with staff, we balance roles and responsibilities to reflect this. 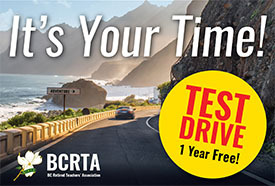 The IT sub-committee with the help of BCTF production staff had a successful round of video interviews with Directors and with members of a number of BCRTA Committees. Sterling Campbell and Dave Scott were wonderful interviewers, putting us at ease and making the experience both interesting and exciting. The questions ranged from why we value the BCRTA, to why retirees should join the BCRTA, to what we personally are doing to have a successful retirement. This material will be used in our Pension Workshops and to promote ourselves to retired educators around BC. With this early success, it may be that new careers are opening up for some of our group! Interviews with our Board and special guests will continue throughout the coming year.